Think back to your high school days - for some, it may not have been that long ago, but for others, it probably feels like an eternity. One thing is consistent for most people, however, and it’s the feeling that being a high school student is a full-time job. Now imagine that you want to play disc golf 24/7 and hone in your skills with the goal of being one of the top players in your area and perhaps even in the nation. Does that feel like a full-time job? We’d guess it does. For Cynthia Ricciotti, you could say that she’s balancing two full-time jobs and doing exceptionally well at both of them. In this second part of our DD Women’s Series, we’ll learn a little more about how Cynthia masters everything she puts her mind to. If you want to do well at something you can’t just sporadically spend time on it. When it comes to bettering her skills, Cynthia spends a set time each week practicing while also making sure her schoolwork is up to date. “I try to practice as much as I can, at least 4 or 5 times a week if it’s not super hot or super cold. I get in a good balance of playing courses, doing field work, and putting practice - I try to get all the stuff into the week. I’m a really good student so school always mainly comes first, and if I have a ton of homework I’ll skip practice,” she shared. With her dad as her coach, Ricciotti knows that the time she puts into practice directly translates into her success on the course. 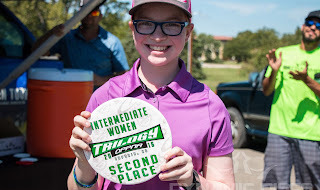 Yet there’s another element to her life that blends school and disc golf in a pretty unique way. It’s this attitude of community and giving back that has made Cynthia such an incredible role model not only for the juniors in her area but for all players across the nation. Her determination and commitment to getting good grades while also shredding the disc golf course is something to really admire. It just might even inspire some of us adults to get a little more involved! Make sure to check back in with us and read the upcoming Part 3 in Cynthia’s blog series, where she’ll explain how she got a sponsorship as a junior player.